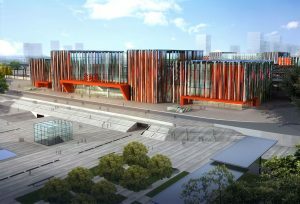 Binhai Railway Station, located 5 km from Tanggu town centre, is one of the four main traffic terminals of the Tianjin railway system. 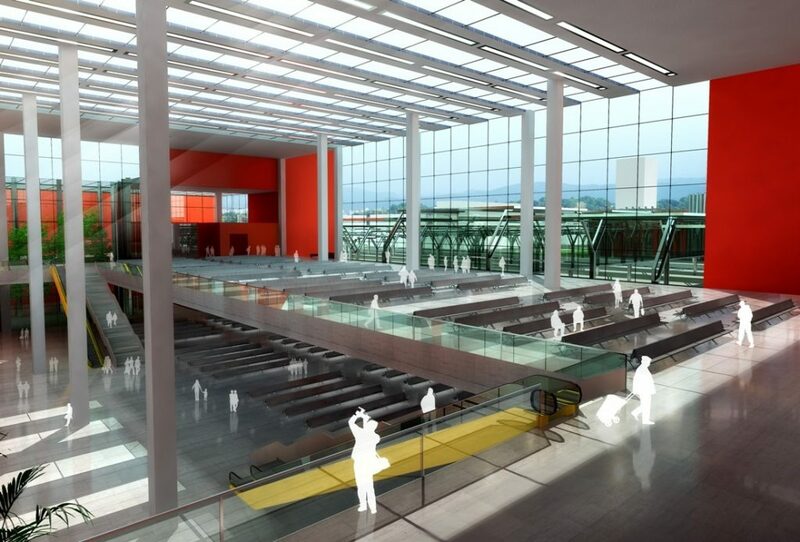 It is planned for a future capacity of 4.5 million passengers/year (by 2020), respectively 5.9 million/year in a long term. The station’s surrounding is dedicated to high-level service industries, with offices, hotels & conference facilities, research base, culture and entertainment. Continue reading "Binhai Railway Station & Traffic Hub"
In addition, main functions will include diverse commercial services, mixed retail and shopping mall, an international hospital as well as apartments. 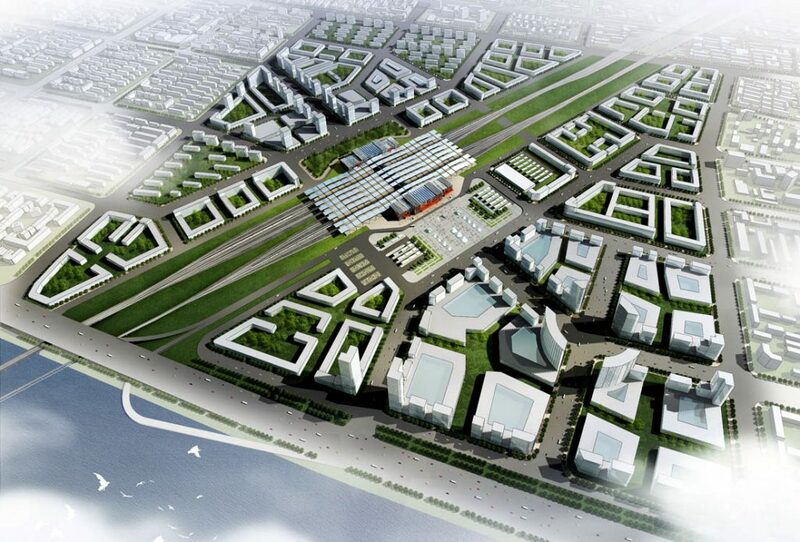 Brief: a new commercial centre will be developed within the booming Binhai New Development Zone. 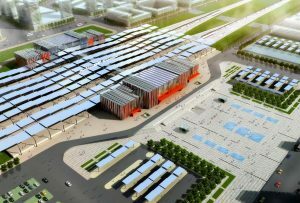 In peak hours, the motor flow rate passing in and out Binhai Station will be about 2,600 pcu per hour. Dealing with the heavy vehicle-bound traffic and the massive passenger flows between the different public transportation modes was one of the key issues of the urban planning which could be solved in an efficient, logical and elegant way. 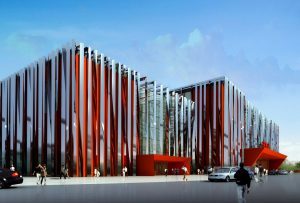 Impetus for the architectural design on the other hand was to create a distinctive building as initialization for the rapidly growing urban surrounding. This building should convey a strong yet calm gesture to serve as durable and timeless centre within the upcoming environment. 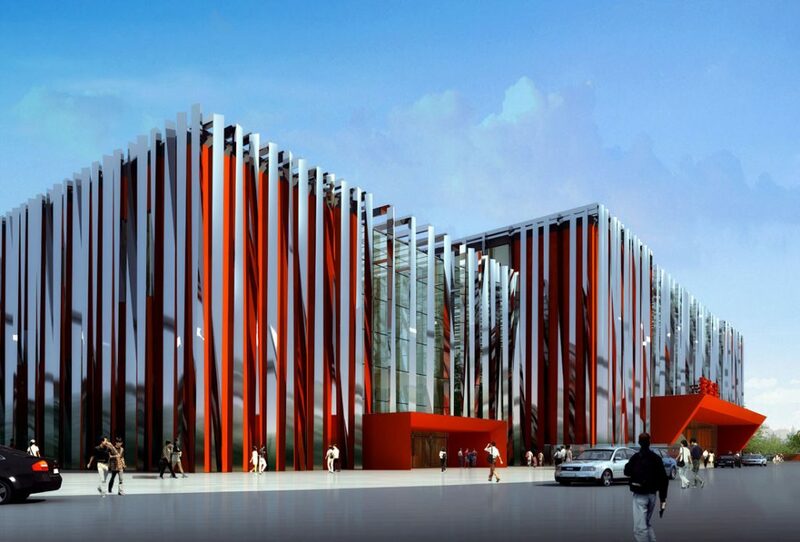 An urban axis has been created focussing on the centre of the building and strengthening its raised middle part. Furthermore the building is closely connected to the vast open public squares on both sides of the railway line, to emphasize the comfortable pedestrian exchange between all the means of private and public transport: kiss-and-ride, taxi, 3 subway and LRT lines crossing the station underneath, city buses, long-distance coaches, etc. Despite the sometimes exaggerated requirements for the size of public spaces in China, human scale and priority to pedestrians have been the leading design ideas. 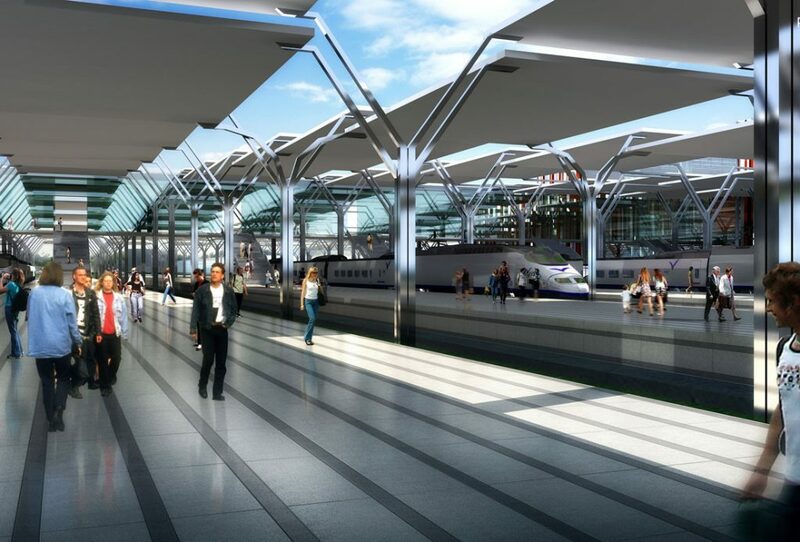 The facade is one important element to strengthen this strategy: Approaching the station, the innovative structure of the facade will create various blurring impressions, making passengers and visitors curious to come closer. Whereas the functional layout of the station is rather simple and economic, the façade is the outstanding element which – by simple means: irregularly twisted metal stripes – creates a memorable building for the public. In this building traditional and contemporary elements are combined: A three-partite, symmetrical volume in classical proportions gives the impression of importance, durability and solidity, all of which are essential for setting the building off from an (expected) heterogeneous urban surrounding. The red metal curtain emphasizes this effect: It can be seen and read like the curtain in a theatre, where the station serves as stage for human interaction. 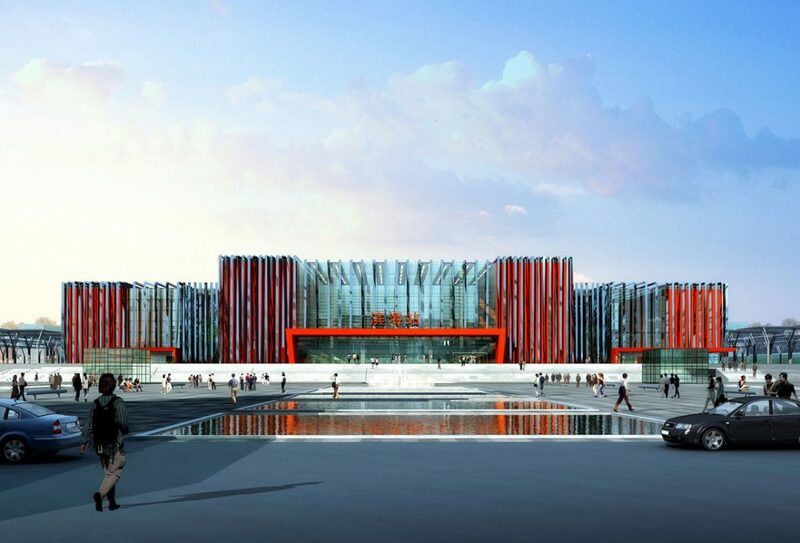 The dominating red colour is one of the traditional colours of Tianjin and ties the building to its location. 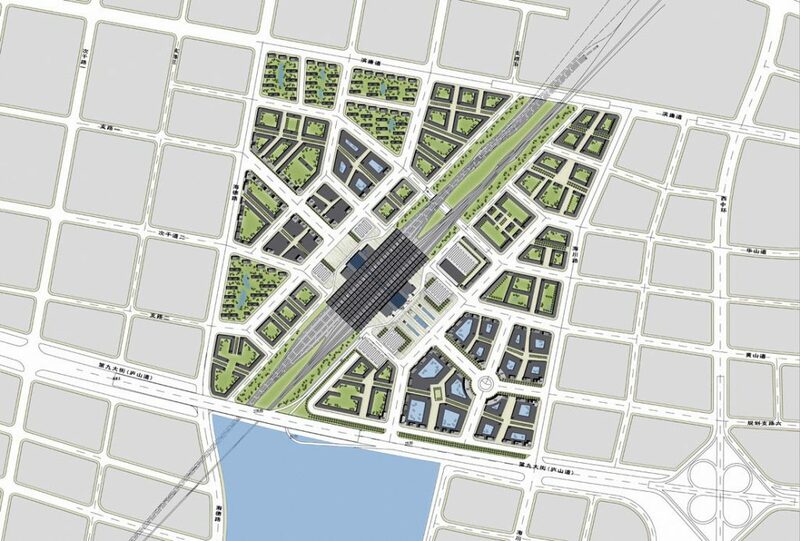 The design is mediating between a conventional station building and a symbol for the needs of the future, which are rather represented in a platform for different traffic modes than in a traditional railway station.